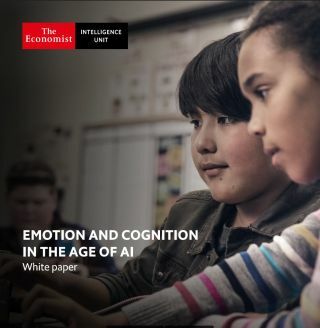 Microsoft today released new global research on the topic of “Emotion and Cognition in the Age of AI.” Conducted by The Economist Intelligence Unit (EIU), the research explores what educators and school systems can do to help students thrive in our rapidly changing world, and how technology can help. Barbara Holzapfel, General Manager, Microsoft Education Marketing wrote, "Our findings spotlight the vital importance of helping students cultivate a sense of happiness and well-being, so they can thrive in school and in life. We listened to more than 760 educators in 15 countries, interviewed leading experts and reviewed 90 pieces of original research. Educators around the world view well-being as an engine of cognition and learning. Seventy-nine percent of educators believe positive emotions are “very” or “extremely” important for helping students to achieve academic success, and support for well-being as an educational issue spans varied cultural, social and economic contexts across Asia, Latin America, North America, Australia and Europe. Substantial majorities say that emotional well-being is “very” or “extremely” important for developing foundational literacies (77%) such as reading and mathematics, and for emotional literacy (82%), communication skills (81%) and critical thinking (78%). Recognizing the rise in anxiety and depression among young people, and the changing labor markets they face in the AI age, seven out of ten educators believe that emotional well-being has grown more important since they started their career. Half of schools have well-being policies in place; the remainder are developing formal policies or promoting emotional health in ad hoc ways. Fifty-three percent of schools have an explicit well-being policy in place. The remainder are either developing a well-being policy (23%) or support well-being in more ad hoc ways. Only 3% have no policy or plans to develop one. Current approaches include mindfulness lessons, resilience training, emphasis on self-directed learning, reducing examinations and workload pressure, emotional “charters”, restorative over punitive disciplinary tactics, group work to encourage social learning, exposure to nature, and even adjusting school hours to increase students’ sleep time. Optimal strategies include support for teachers’ well-being, involve the collection and analysis of rigorous subjective and objective data, and are school-wide. Teachers can suffer burnout, as their roles are administratively complex, workload-heavy and emotionally demanding. As such, experts argue that a holistic strategy must also nurture teacher well-being; 72% of respondents believe a teacher’s mood influences the well-being of children, while an inclusive and safe class environment, which teachers define and create, has a positive effect on child well-being, according to 83% of respondents. Practitioners also advise against sporadic pilots or isolated programs. Well-being policies must be school-wide, with emotions conceived as an engine of learning rather than a form of pastoral care. Tech’s double-edged implications for well-being. The rise of education technology has made learning more personalized and engaging, while advances in affective and behavioral computing are assisting students who have disabilities like autism. Collaborative platforms are opening new spaces for group work, and amplifying students’ voices. Virtual and augmented reality are being used to develop social skills like empathy and understanding the world from other people’s perspectives, helping to teach about issues like social marginalization and racial, ethnic or gender biases, among others. However, digital devices and social media platforms may worsen youth problems like bullying and social anxiety, and are linked—in some use cases, devices and applications—to sleep disruption, and to distractions and difficulty in concentrating. Innovators and educators must work to advance an educational technology agenda that supports social and emotional health and distinguish between helpful and harmful uses of technology.